Grand Duke Myhaylo Romanov, brother of Tsar Nicholas II of Russia, is perhaps most remembered for the fact that he fell in love with and married a divorced commoner, Nathalia (Natasha) Sheremetievskaja (Wulfert), in 1911, and spent the remaining years of his life battling for acceptance of their marriage. 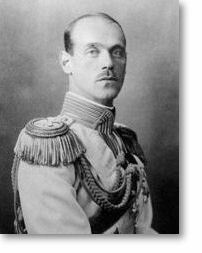 Tsar Nicholas abdicated in Myhaylo’s favour on 28 March 1917, a year before both were murdered. Though Myhaylo renounced the throne the following day, ostensibly because the Russian people would never have accepted his wife, some consider him to be the last Tsar of Russia. A fact that is most certainly less well known about Myhaylo Romanov is that during the winter of 1914-15, in the midst of the First World War, the younger brother of the Tsar of Russia spent time in the modest town of Tluste. 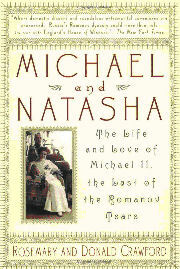 The story of Myhaylo and Natasha is chronicled in a fascinating book published in 2001, entitled: “Michael and Natasha: The Life and Love of Michael II, the Last of the Romanov Tsars”. Click for a description of the book's contents. The Austrians had managed to drive the Russian (Moskals) from Halychyna, and the front line was on the Dniester river, close to Zalishchyky, Ustechko and other towns in the vicinity of Tluste. A so-called “Wild Division” was sent there, consisting of seven regiments of Caucasian nations. Discipline among the volunteer soldiers was very poor, and they were reputed to have murdered local Jews. The commandant of this division was none other than Grand Duke Myhaylo. His grand arrival in Tluste was recorded in the photograph, below, preserved by the Gogol family. 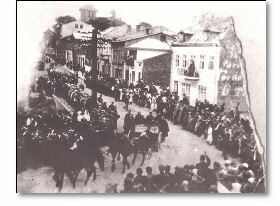 The scene shows Myhaylo and his entourage in a horse-drawn carriage, turning west onto what is today Hrushevskoho Street, having passed through the centre of town from the north. The local townspeople are lining the main street, and a brass band stands at the ready, just as they pass over the bridge. Grand Duke Myhaylo is said to have occupied the best house in Tluste, belonging to Baron Hirsh, some 50m down Hrushevskoho Str., and he used it as the headquarters of his division. The house was destroyed during the war, and today there is a small park and a monument to Bohdan Khmelnytskyy standing in its place. At the time, no one could have predicted that this extraordinary visitor to Tluste would have been given the chance, a couple of years later, to become Tsar of Russia -- perhaps somehow altering the course of the Bolshevik Revolution had he seized the opportunity -- or that his life and the lives of so many of his family, would end so dramatically in 1918. Amazon.com. Book Description; last accessed on 7 May 2006. Encyclopedia Britannica 2003 Deluxe Edition CD-ROM.